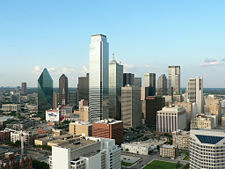 Population Ranked 2nd in the U.S.
Ranked 26th in the U.S.
Texas is a state located in the south-central United States. Austin is the state capital and it is nicknamed the Lone Star State. Texas—the second largest U.S. state in both area and population covering 268,820 square miles (696,200 km²) and has a steadily growing population of 23.9 million. Houston is the state's largest city and the fourth-largest city in the United States. 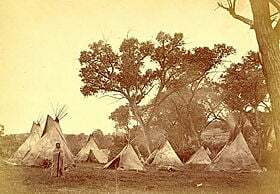 The history of the state's settlement an admittance to the United States is a bloody one, involving battles with Native Americans, the Texas Revolution and its War of Independence from Mexico. The Texan history includes the famous Battle of the Alamo, its ten-year period as the Republic of Texas, and its annexation by the U.S. and its period of secession following the Mexican American War. Texas seceded from the United States to join the Confederate States of America and was re-admitted into the Union after the Civil War in 1865. When oil discoveries initiated an economic boom in the early twentieth century, Texas's economy has diversified to include technology, biomedical research, and higher education. The state's gross state product ranks as the second-highest in the United States. Texas’s energy industry supplies 20 percent of the nation’s petroleum production, one-third of its natural gas, one-fourth of the gasoline refining capacity, and nearly 60 percent of the nation’s chemical manufacturing. Due to its long history as a center of the American cattle industry, Texas is associated throughout much of the world with the image of the cowboy. Historically and culturally, Texas is part of the American South. However, with its Spanish and Mexican roots, it can also be classified as Southwestern. Map of Texas, showing major cities and roads. 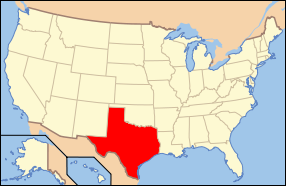 Texas is located at the southernmost part of the Great Plains, which ends in the south against the folded Sierra Madre Oriental of Mexico. It is in the south-central part of the United States of America. The Rio Grande, Red River, and Sabine River form natural state borders, with Oklahoma on the north, Louisiana and Arkansas on the east, and the Mexican states of Chihuahua, Coahuila, Nuevo León, and Tamaulipas to the south. The state's Panhandle has an eastern border with Oklahoma, a northern border with Oklahoma, and a western border with New Mexico. Traveling east to west, the landscape of Texas gradually evolves from that of the Deep South into that of the desert Southwest, going from piney woods to semi-forests of oak and other trees, into rolling plains and prairie, then finally to desert in the Big Bend National Park. The large size of Texas and its location at the intersection of multiple climate zones gives the state very variable weather. The Panhandle has colder winters than North Texas, while the Gulf Coast has mild winters. Texas also has wide variations in precipitation patterns. El Paso, on the western end of the state, averages as little as 8 inches (200 mm) of annual rainfall, while Houston, in the southeast, averages as much as 54 inches (1,400 mm) per year. Dallas in the north central region averages a more moderate 37 inches (940 mm) per year. Snowfall often falls in the winter months in the north. Maximum temperatures in the summer months average from the 80s °F (26 °C) in the mountains of West Texas and on Galveston Island to around 100 °F (38 °C) in the Rio Grande Valley to 80 °F (27 °C) in Galveston. Thunderstorms strike Texas often, especially the eastern and northern portion of the state. Tornado Alley covers the northern section of Texas. The state experiences the most tornadoes in the Union, an average of 139 a year. These strike most frequently in north Texas and the Panhandle and generally occur in the months of April, May, and June. Some of the most destructive hurricanes in U.S. history have impacted Texas. A hurricane in 1875 killed approximately 400 people in Indianola, followed by another hurricane in 1886 that destroyed the town, at the time the most important port city in the state. This allowed Galveston to take over as the chief port city. The Galveston hurricane of 1900 subsequently devastated that city, killing approximately 8,000 people (possibly as many as 12,000), making it the deadliest natural disaster in U.S. history. Other devastating Texas hurricanes include the 1915 Galveston hurricane, Hurricane Audrey in 1957 (which killed over 600 people), Hurricane Carla in 1961, Hurricane Beulah in 1967, Hurricane Alicia in 1983, Hurricane Rita in 2005, and Hurricane Ike in 2008. 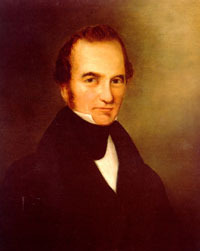 Stephen F. Austin, in important figure in early Texas. Republic of Texas. The present-day outlines of the U.S. states superimposed on the boundaries of 1836–1845. Spindletop, the first major oil well in Texas. American Indian tribes that once lived inside the boundaries of present-day Texas include Apache, Atakapan, Bidai, Caddo, Comanche, Cherokee, Kiowa, Tonkawa, Wichita, Hueco, and the Karankawa of Galveston. Currently, three federally recognized Native American tribes reside in Texas: The Alabama-Coushatta Tribe, the Kickapoo Traditional Tribe, and the Ysleta Del Sur Pueblo. Alonso Álvarez de Pineda made the first documented European sighting of Texas in 1519. On November 6, 1528, shipwrecked Spanish conquistador Álvar Núñez Cabeza de Vaca became the first known European in Texas. In 1685 René Robert Cavelier de La Salle established the first European community in Texas, the French colony of Fort Saint Louis. The colony, located along Matagorda Bay, lasted only four years before succumbing to harsh conditions. Due to the perceived French encroachment, Spain established its first presence in Texas in 1691, constructing missions in East Texas. The missions failed quickly, and Spain did not resettle Texas until two decades had passed. Spain returned to East Texas in 1716, again establishing missions as well as a presidio to maintain a buffer between New Spain and the territory of Louisiana. Two years later, Spain established the first European civilian settlement in Texas, San Antonio. Its remoteness from New Spain and the hostility of native tribes, whose traditional ways of life were being threatened through loss of land, discouraged settlers from moving to Texas, and it remained one of New Spain's least populated provinces. The Spanish signed a peace treaty with the Apache in 1749 and with the Comanche in 1785. An increased number of missions in the province allowed for the peaceful conversion of other tribes to Christianity. 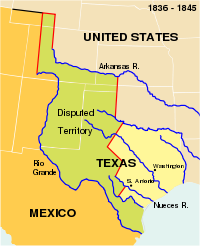 The Louisiana Purchase by the United States caused a border dispute over Texas. The signing of the Adams-Onís Treaty, recognizing the Sabine River as Texas's eastern boundary, resolved the dispute in 1819. In 1821, after the Mexican War of Independence, the territory became a part of the new country. Texas became the northern section of Coahuila y Tejas in 1824. Mexico ended the Spanish policy of allowing only full-blooded Spaniards to settle Texas. On January 3, 1823, after obtaining authorization from the governor, Stephen F. Austin began a colony of 297 Anglo-American families known as the "Old Three Hundred" along the Brazos River. By 1830, the 30,000 Anglo settlers in Texas outnumbered Tejanos six to one. The Convention of 1832 and the Convention of 1833 were responses to rising unrest at policies of the Mexican government. Delegates feared the end of duty-free imports from the United States and the threat of ending slavery. In 1835, Antonio López de Santa Anna, president of Mexico, enacted a constitution that created a centralized government with power concentrated in the president. Texans also resented policies such as the forcible disarmament of settlers and the expulsion of immigrants and legal landowners originally from the United States. On March 2, 1836, the Convention of 1836 signed a Declaration of Independence. On April 21, 1836, the Texans—led by General Sam Houston—won their independence at the Battle of San Jacinto. Santa Anna's capture led to the Treaties of Velasco. Mexico repudiated the treaties and vowed to reconquer Texas. Later in 1836, the Texans adopted a constitution that formally legalized slavery. The Republic of Texas included the area of the present state of Texas and additional unoccupied territory to the west and northwest. Most Texans supported annexation of their Republic into the United States. Events such as the Dawson Massacre and two recaptures of Béxar in Texas of 1842 added urgency to the desire for statehood. However, strong abolitionist opposition to adding a slave state blocked Texas's admission until pro-annexation James K. Polk won the election of 1844. On December 29, 1845, Congress admitted Texas as a state. The Mexican–American War followed, with decisive victories by the U.S. The Compromise of 1850 set Texas's boundaries at their present form. Texas ceded land that later became half of present-day New Mexico, a third of Colorado, and small portions of Kansas, Oklahoma, and Wyoming, in return for the federal government's assumption of $10 million of the old republic's debt. Postwar Texas grew rapidly as migrants poured into the cotton lands of the state. A charter member of the Confederacy, Texas was a "supply state" for Confederate forces during the American Civil War due to its distance from the front lines, contributing men, especially cavalry. Texan regiments fought in every major battle throughout the war. In mid-1863, the Union capture of the Mississippi River cut Texas supply lines to the eastern parts of the Confederacy. Violence marked the early months of Reconstruction. 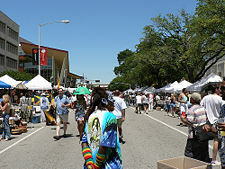 Juneteenth commemorates the announcement of the Emancipation Proclamation on June 19, 1865, in Galveston by General Gordon Granger, over 2–1/2 years after the original announcement. President Andrew Johnson, on August 20, 1866, declared that civilian government was restored in Texas. Despite not meeting Reconstruction requirements, on March 30, 1870, Congress readmitted Texas into the Union. Social volatility continued as the state struggled with agricultural depression and labor issues. A dust storm approaches Stratford, Texas in 1935. 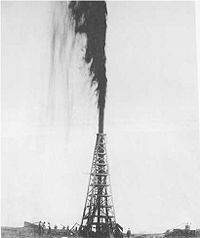 The first major oil well in Texas was Spindletop, south of Beaumont, on January 10, 1901. Other fields were later discovered nearby in East Texas, West Texas, and under the Gulf of Mexico. The resulting “Oil Boom” permanently transformed the economy of Texas. Oil production eventually averaged three million barrels per day at its peak in 1972. The Great Depression and the Dust Bowl dealt a double blow to the state's economy. Migrants abandoned the worst-hit sections of Texas during the Dust Bowl years. Especially from this period on, African Americans left Texas to get work in the northern United States or California and to escape the oppression of segregation. With increased immigration from other sources, although the numbers of African Americans increased, their proportion of the population had decreased from 20.4 percent in 1900 to 12.4 percent by 1960. Texas has a plural executive branch system that limits the power of the governor. Except for the Secretary of State, voters elect executive officers independently, making candidates directly answerable to the public, not the governor. This election system has led to some executive branches split between parties. The current governor is Rick Perry. The bicameral Texas Legislature consists of the House of Representatives, with 150 members, and a Senate, with 31 members. The judicial system of Texas is one of the most complex in the United States, with many layers and overlapping jurisdictions. Texas has two courts of last resort: the Texas Supreme Court, for civil cases, and the Texas Court of Criminal Appeals. Except for some municipal benches, partisan elections select judges at all levels of the judiciary. Although only capital murder is eligible for the death penalty, Texas led the nation in executions (400) from 1982 to 2007. Known for their role in Texas law enforcement history, the Texas Ranger Division of the Texas Department of Public Safety continues to provide special law enforcement services to the state. Like in other "Solid South" states, whites resented the Republican Party after the Civil War. After regaining power near the end of Reconstruction, the Democratic Party maintained a monolithic political presence in Texas until the late twentieth century. As of the general elections of 2008, a large majority of the members of Texas's U.S. House delegation were Republican, and both U.S. senators were Republicans. In the 111th United States Congress, of the 32 congressional districts in Texas, 20 were held by Republicans and 12 by Democrats. Since 1994, Texans have not elected a Democrat to a statewide office. The Texas political atmosphere leans toward fiscal and social conservatism. Since 1980, most Texas voters have supported Republican presidential candidates. In 2000 and 2004, Republican George W. Bush won Texas with 60.1 percent of the vote, due in part to his "favorite son" status as the governor. John McCain won the state in 2008, but by a smaller margin. Austin consistently leans Democratic in both local and statewide elections. Houston and Dallas remain approximately split. Counties along the Rio Grande often vote Democratic. Texas's large population, abundance of natural resources, and diverse population and geography have resulted in a large and highly diverse economy. 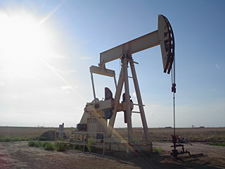 Since the discovery of oil, the state's economy has reflected the state of the petroleum industry. In recent times, urban centers of the state have diversified. Nevertheless, growth in the state's economy has caused problems associated with urban sprawl. In the fourth quarter of 2006, Texas had a gross state product of $1.09 trillion, the second highest in the nation. 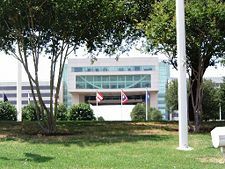 The state holds the most Fortune 500 company headquarters in the United States. 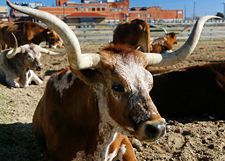 Texas has the most farms—both in number and acreage—in the United States and leads the nation in livestock production. Cattle is the state's most valuable agricultural product, but the state also leads nationally in production of sheep and goat products. Texas also leads the nation in production of cotton, its second-most-valuable farm product. The state grows significant amounts of cereal crops and produce. Texas also has a large commercial fishing industry. With mineral resources, Texas leads in creating cement, crushed stone, lime, salt, sand, and gravel. According to the Energy Information Administration, Texans consume the most energy in the nation, both per capita and as a whole. Since 2002, Texas deregulated its electric service. The Railroad Commission of Texas, contrary to its name, regulates the state's oil and gas industry, gas utilities, pipeline safety, safety in the liquefied petroleum gas industry, and surface coal and uranium mining. Until the 1970s, the commission had enormous control over the price of petroleum because of its ability to regulate Texas's oil reserves. The founders of the Organization of Petroleum Exporting Countries (OPEC) used the Texas agency as one of their models for petroleum price control. The state has known petroleum deposits of about 5 billion barrels (790,000,000 m³), which makes up approximately one-fourth of the known U.S. reserves. The state's refineries have the capability to process 4.6 million barrels (730,000 m³) of oil a day. With well depletion in the eastern portions of the state, drilling has moved westward. Several petroleum companies are based in Texas, such as Conoco-Phillips, Exxon-Mobil, Halliburton, Valero, and Marathon Oil. Texas leads in natural gas production, accounting for one-fourth of the nation's supply. The state also leads in renewable energy sources, producing the most wind power nationwide. A wide array of different high-technology industries have developed in Texas. The Austin area is nicknamed "Silicon Hills" and the north Dallas area the "Silicon Prairie." Texas has the headquarters of many high-technology companies, such as Dell, Inc., Texas Instruments, Perot Systems, AT&T, and Electronic Data Systems (EDS). As for emerging technologies, in 2008, FierceBiotech ranked Texas as one of the top five biotechnology states. 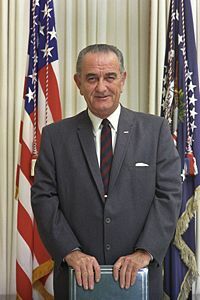 The Lyndon B. Johnson Space Center, operated by the National Aeronautics and Space Administration (NASA), located in southeast Houston, sits as the crown jewel of Texas's aeronautics industry. Fort Worth hosts both Lockheed Martin's Aeronautics division and Bell Helicopter Textron. Lockheed builds the F-16 Fighting Falcon, the largest Western fighter program, and its successor, the F-35 Lightning II, in Fort Worth. Texas's affluence stimulates a strong commercial sector consisting of retail, wholesale, banking and insurance, and construction industries. The North American Free Trade Agreement (NAFTA) contributes to Mexico, the state's largest trading partner, importing one third of the state's exports. Due to the state's large size and rough terrain, Texas has built America's largest highway and railway systems in terms of mileage. Texas's central location within the North American continent has made it an important transportation hub. From the Dallas-Fort Worth area, trucks can reach 93 percent of the nation's population within 48 hours, and 37 percent within 24. Texas has the most airports of any state in the nation. Largest of these is Dallas-Fort Worth International Airport (DFW), the second largest in the United States, and fourth largest in the world. Over 1,000 seaports dot Texas's coast with over 1,000 miles (1,600 km) of channels. Texas ports connect with the rest of the Atlantic seaboard with the Gulf section of the Intracoastal Waterway. With the completion of the Houston Ship Channel in 1919, the Port of Houston became the busiest port in the United States in foreign tonnage, second in overall tonnage, and tenth worldwide in tonnage. Part of the state's tradition originates from cattle drives to railroads in Kansas. The first railroad in Texas was completed in 1872. Since 1911, Texas has led the nation in railroad length. 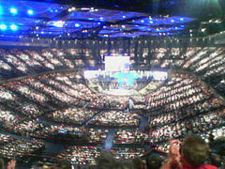 The interior of Lakewood Church, in 2007 the largest megachurch in the U.S. It occupies the arena previously home to the Houston Rockets. As of 2006, the state had an estimated population of 23,507,783, an increase of 2.5 percent from the prior year and 12.7 percent since the year 2000. As of 2004, the state had 3.5 million foreign-born residents (15.6 percent of the state population), of whom an estimated 1.2 million were illegal immigrants. From 2000–2006 Texas had the fastest growing illegal immigration rate in the nation. Texas lies in the socially conservative Evangelical Protestant Bible Belt, and has the highest percentage of people with a religious affiliation in the United States. Dallas-Fort Worth, home to three major evangelical seminaries, has several megachurches, including Fellowship Church, Potter's House, and Prestonwood Baptist Church. Houston is home to the largest "church" in the nation, Lakewood Church. Lubbock, according to local lore, has the most churches per capita in the nation. The largest denominations by number of adherents in 2000 were the Roman Catholic Church, the Southern Baptist Convention, and the United Methodist Church. Texas has a total of 25 metropolitan areas, with four having populations over 1 million and two over 5 million. Texas has the most cities, three, with populations exceeding 1 million: Houston, San Antonio, and Dallas. These three rank among the 10 largest cities of the United States. In contrast to the cities, Texas has rural, unincorporated settlements called colonias, which often lack basic infrastructure and are marked by poverty. As of 2007, Texas had at least 2,294 colonias, located primarily along the state's 1,248-mile (2,008 km) border with Mexico. Texans have a plethora of professional sports teams to cheer for. Texas has two NFL teams, the Dallas Cowboys and the Houston Texans; two Major League baseball teams, the Texas Rangers and Houston Astros; three NBA teams: The Houston Rockets, the San Antonio Spurs, and the Dallas Mavericks; and one National Hockey League team, the Dallas Stars. 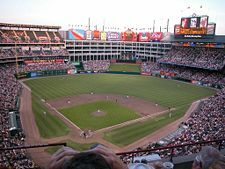 The Dallas/Fort Worth metropolitan area is one of only 13 American cities that hosts sports teams from all the "Big Four" professional leagues. Texans also enjoy the rodeo. The annual Houston Livestock Show and Rodeo, the largest rodeo in the world, begins with trail rides that originate from several points throughout the state, which convene at Reliant Park. The Southwestern Exposition and Livestock Show in Fort Worth has a cowboy, a Mexican, and many traditional rodeos. Dallas hosts the State Fair of Texas each year at Fair Park. The Texas Education Agency (TEA) administers the state's public school systems. Texas has over 1,000 school districts—all districts except the Stafford Municipal School District are independent from municipal government and many cross city boundaries. Due to court-mandated equitable school financing for school districts, the state has a controversial tax redistribution system called the "Robin Hood plan," which transfers property tax revenue from wealthy school districts to poor ones. The TEA has no authority over private or home school activities. Southern Methodist University in Dallas. The second president of the Republic of Texas, Mirabeau B. Lamar, set aside land for the support of two universities that would later become the basis of the state’s Permanent University Fund. Discoveries of valuable minerals, principally oil, on this land is the basis of the state’s two largest university systems, the University of Texas System and the Texas A&M University System. The PUF principal in fall 2005 was approximately $15 billion, second in size only to Harvard University's endowment. In addition to the state's two PUF university systems, Texas has four other state university systems and four independent public universities. These university systems are the University of Houston, University of North Texas, Texas State, and Texas Tech. Texas's controversial alternative affirmative action plan guarantees Texas students who graduated in the top 10 percent of their high school class automatic admission to state-funded universities. The University of Texas and Texas A&M University are flagship universities of the state of Texas. Both were established by the Texas constitution and hold stakes in the Permanent University Fund. While Texas did not form public universities until its statehood, the former republic chartered two private universities: Baylor University and Southwestern University. Other prominent private institutions include Rice University in Houston, Texas Christian University in Fort Worth, and Southern Methodist University in Dallas. Texas emits the most greenhouse gases in the United States. The state emits nearly 1.5 trillion pounds (680 billion kg) of carbon dioxide annually. As an independent nation Texas would rank as the world's seventh-largest producer of greenhouse gases. Causes of the state's vast greenhouse gas emissions include the state's large number of coal power plants and the state's refining and manufacturing industries. With Texas's high outputs of greenhouse gases, the governor strongly criticized proposed new Environmental Protection Agency (EPA) rules. As the nation’s leading energy producer, the governor said, implementing such regulations would cripple Texas’s energy sector, severely impacting national oil and gas supplies. Further, the governor noted that imposing a large tax burden on energy-producing companies would drive them out of the U.S. to countries that do not have burdensome restrictions. Rather than adopting the EPA’s suggestion to make traditional energy sources more expensive, the governor proposed making alternative energy technologies less expensive, thereby encouraging widespread commercial use and removing barriers to innovation and competition. Modernizing the national energy grid to support wind and solar energy transmission, facilitating investments in the development of carbon capture and sequestration technologies, and removing barriers to investment in nuclear generation would reduce carbon emissions while encouraging competitiveness, innovation, and growth in alternative energy sources. The Commonwealth Fund ranks the Texas health-care system the third worst in the nation. Texas ranks close to last in access to health care, quality of care, avoidable hospital spending, and equity among various groups. In May 2006, Texas initiated the program "code red" in response to a report that the state had 25.1 percent of the population without health insurance, the largest proportion in the nation. 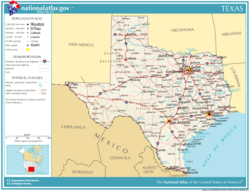 ↑ MLA Language Map Data Center, Most spoken languages in Texas in 2005 Retrieved February 21, 2012. ↑ Metropolitan and Micropolitan Statistical Area Estimates. US Census (2007-04-04). Retrieved April 28, 2008. ↑ Facts. Texas Almanac (2008). Retrieved February 21, 2012. ↑ Environment. Texas Almanac (2008). Retrieved April 29, 2008. ↑ 6.0 6.1 Elevations and Distances in the United States. United States Geological Survey (2001). Retrieved October 24, 2011. ↑ Texas Comptroller of Public Accounts, Gross State Product. Retrieved December 2, 2008. ↑ Clifford Woodruff, October 26, 2006, Gross Domestic Product by State, Bureau of Economic Analysis. Retrieved December 2, 2008. ↑ Netstate.com, June 5, 2007, The Texas Economy. Retrieved December 2, 2008. ↑ Energy Information Administration, Petroleum Profile: Texas. Retrieved December 2, 2008. ↑ University of Texas, Recent Economic Transformations. Retrieved December 2, 2008. ↑ Port of Houston Authority, General Information. Retrieved December 2, 2008. 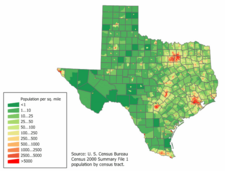 ↑ Texas QuickFacts from the US Census Bureau (2006). Retrieved 2007-04-28. ↑ 16.0 16.1 Association of Religion Data Archives, State Membership Report—Texas. Retrieved December 2, 2008. ↑ United States Census Bureau, Annual Estimates of the Population for Incorporated Places Over 100,000, Ranked by July 1, 2006 Population: April 1, 2000 to July 1, 2006. Retrieved December 2, 2008. ↑ American Legislative Exchange Council: Report Card on American Education, 2007, Texas. Retrieved December 2, 2008. ↑ Associated Press, January 16, 2008, Texas Is No. 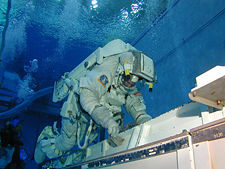 1 Carbon Polluter In U.S. Retrieved December 2, 2008. Chipman, Donald E. Spanish Texas, 1519–1821. Austin, TX: University of Texas Press, 1992. ISBN 0292776594. Hendrickson, Kenneth E., Jr. The Chief of Executives of Texas: From Stephen F. Austin to John B. Connally, Jr. College Station, TX: Texas A&M University Press, 1995. ISBN 0890966419. Weber, David J. The Spanish Frontier in North America. New Haven, CT: Yale University Press, 1992. ISBN 0300051980. Weddle, Robert S. Changing Tides: Twilight and Dawn in the Spanish Sea, 1763–1803. College Station, TX: Texas A&M University Press, 1995. ISBN 0890966613. All links retrieved November 20, 2015. This page was last modified on 20 November 2015, at 15:32.